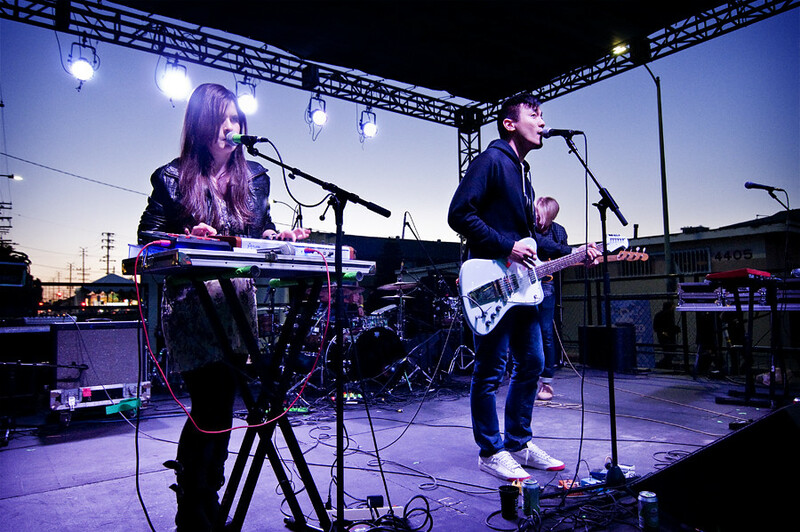 La Sera performs at the 3rd Annual Silver Lake Jubilee. The Third Annual Silver Lake Jubilee has come and gone and as we look back, we are reminded of its humble beginnings and how it's becoming one of Los Angeles' best music, arts and food festivals around. Since The 30-year-old Sunset Junction is no longer around, Los Angeles has been searching for its newest predecessor. A few have popped up. The Jubilee three years ago and Filter Magazine's Culture Collide in October are vying to take the throne. Unlike other major cities that have their own signature festival (Bamboozle in Asbury Park, Chicago's Lollapalooza, Austin's SXSW, Bonnaroo in Tennessee) Los Angeles really doesn't have one since The Sunset Junction folded last year. Some would say Coachella is Los Angeles' premiere festival but it takes place in Indio California, a mere 3 hours outside of the city. Now, let's take a look at The Jubilee. Through their partnership with Sustain LA and the LA Arts and Athletics Alliance, The Silver Lake Jubilee, in its third year, prides itself on their eco-friendly event, with, among other things, being a single-use water bottle-free event, implementing a Zero Waste Initiative with its primary goal of 90 percent landfill diversion, water conservation and use of renewable power resources. What began three years ago with 30 bands and three stages has now moved one block south (from it's usual Myra Street location) to Santa Monica Blvd now including six stages throughout the 5-block festival. International and specialty food trucks, from Lobster to Brazilian to Armenian, lined the street. It cost $5 each day in 2010, now $20 gets you into the festival. But all of it goes back into the local community which is itemized on their official website. The two-day festival now includes more than 60 bands, 15 comedians and a dozen writers and poets were on hand to keep any arts and music lover busy. 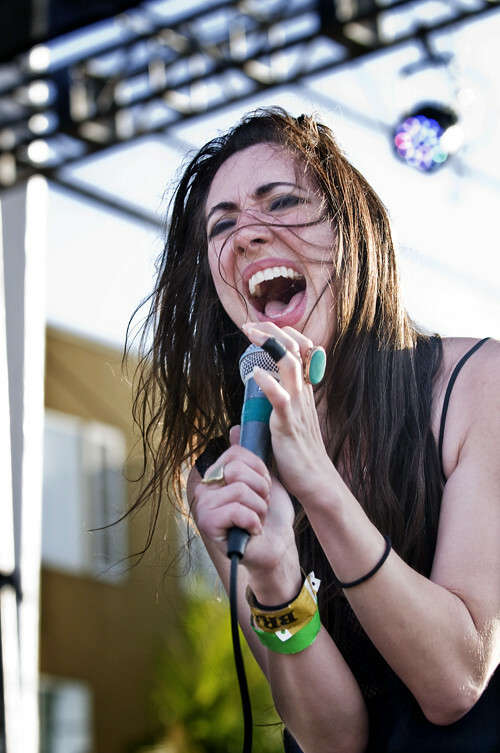 But it was the strong showing of bands featuring women at the forefront. Z Berg of JJAMZ at the 3rd Annual Silver Lake Jubilee. Day One boasted JJAMZ with Z-Berg, former front-woman of all-girl group The Like and other musicians that includes Rilo Kiley's Jason Boesel, Phantom Planet's Alex Greenwald and Maroon 5's James Valentine and Michael Runion. (Maroon 5's James Valentine, although part of the group didn't attend.) In what has to be my favorite band coming out of the Jubilee, JJAMZ (pronounced: Juh-Jamz) is dropping their debut album, Suicide Pact on July 10th. With a classic-surf-pop vibe, their free-floating melodies are what, I imagine, vintage California postcards must sound like if they came with a soundtrack. Carefree and fun...romantic in a way you would imagine a day spent with that special someone and then realizing the hours had passed by too quickly. You can only wish to slow down that sunset to make that moment last forever. 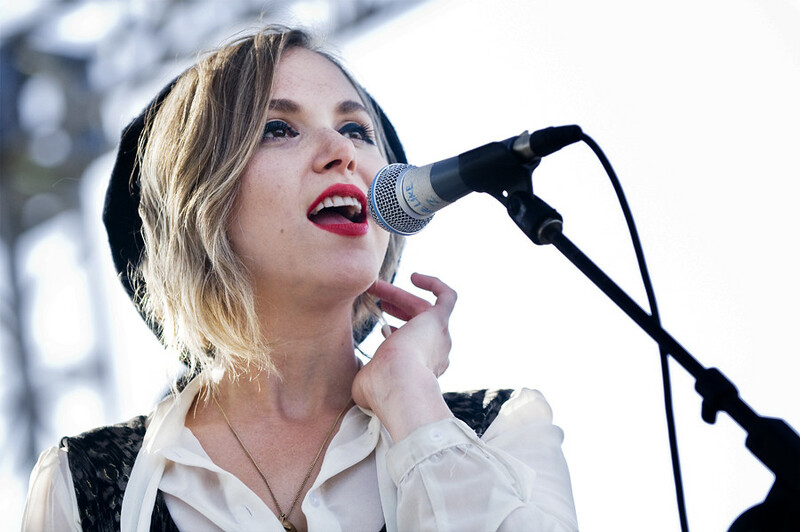 Z-Berg's voice is as fragile as her soft features and evokes longing and heartbreak in songs like "Never Enough" and "Poolside." They begin a Monday Residency at The Satellite for the month of June starting this Monday. Leslie Stevens on Day 1 of The Jubilee. Soft spoken but with a commanding voice, Leslie Stevens & The Badgers began the day with sounds of classic Americana. Often times playful yet keeping the soul that underlines her songs, Leslie Stevens strengths shows in her understatements. Like the Nashville sounds of Nanci Griffith, simplicity is often times more powerful in its restraint which is what I love about Leslie. Her songs, a week later, are still with me and made me seek more about her. 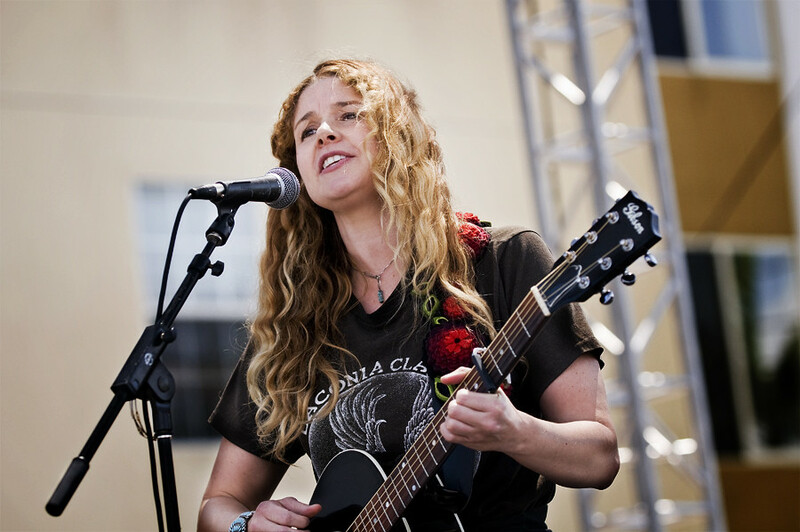 You can listen to a few of her songs at her website right HERE. Psychedelic-pop darlings The Dunes bathe themselves in the dark sounds of the underground, inspired by the subterranean and pop synth music fromt he 60s through the 90s. 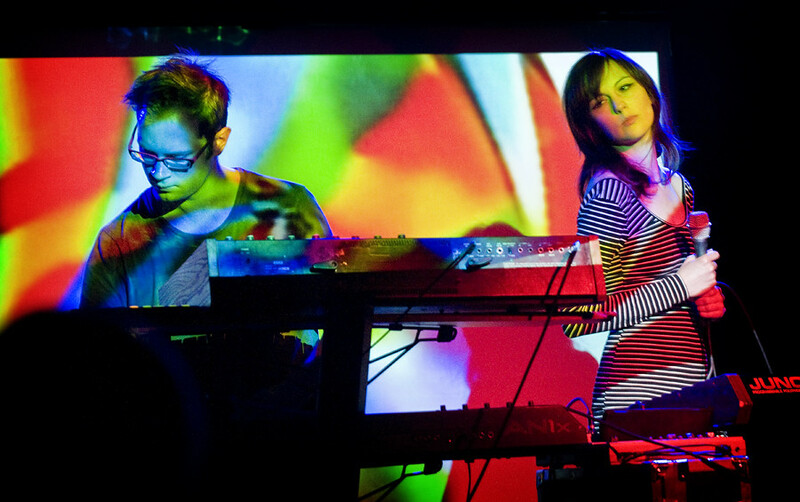 In March, they released their debut album Noctiluca that Pitchfork labeled as 'welcoming and beautiful.' Stephanie Chan, Mark Greshowak and Katelyn Hall who comprise the LA-based band mix dark tones with their streaky-electro melodies evoking lost, dark highways and explorations of the unknown which works for them since, all the while, as you listen to them, it becomes increasingly easy to get lost and hypnotized by their songs. For an hour set, it was surely a welcomed experience. 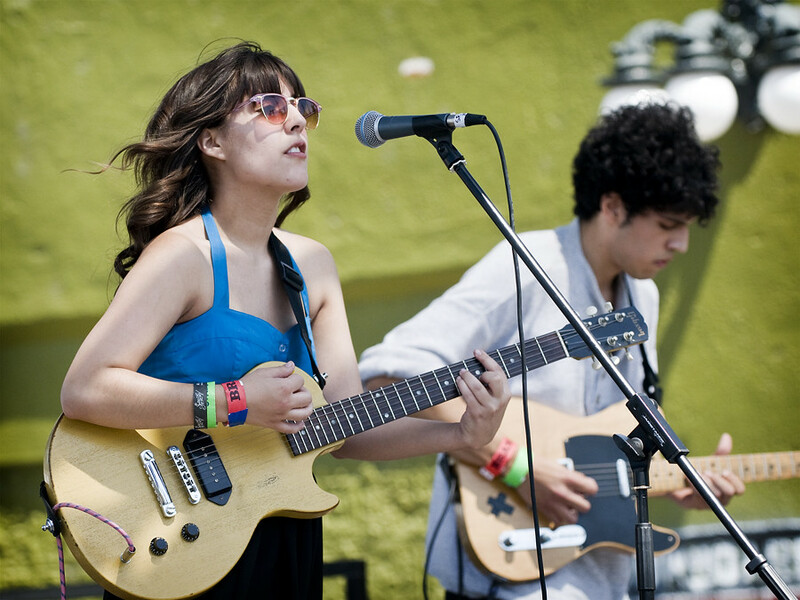 Their next performance will be at The Bootleg Theater June 30th. With six stages surrounding this outdoor festival, two of those stages took place in the cooler confines indoors. One being the gay friendly stage at Eagle, the other at El Cid which hosted bands as well as comedians. Portland-based synth-dance outfit, Soft Metals basked in psychedelic lights giving mood to dance amongst the already alcoholic buzzed fans in front of the stage. Creating an eerie scene inside El Cid, Ian Hicks provided the sonic landscaping of trip-hoppy atmospherics to Patricia Hall's cascading vocal volleys. For a split second, you forgot that just at the outside patio, people were drinking mojitos and mimosas under the summer sun. Inside was totally different mood, created by Soft Metals as they transported you to another place that I hope to experience again someday. As the night got cooler, the musical acts got hotter. Letting Up Despite Great Faults, from Austin Texas, showcased why they've been hailed by Pitchfork and Rolling Stone for their indie-dream charm. LUDGF evokes 90's alternative, incorporating electro-pop by way of synths which easily could've been included in any John Hughes film. I half expected to see Molly Ringwald prance onstage as Duckie admired from the beer garden. Who needs a time machine when you've got Letting Up Despite Great Faults to make you feel young again. Afterwards, I stayed for headliners Autolux, playing into the night with full hour sets, a fine ending to a fulfilling day of music. The Silver Lake Contemporary Ballet accompanied by The Lonely Wild on Day 2 of the Silver Lake Jubilee. Day two began the way day one ended, with great weather, great music all in a great atmosphere. The day began with The Lonely Wild partnering up with the Silver Lake Contemporary Ballet in what had to be one of the most inspired acts of the weekend. Singing songs from their critically acclaimed EP Dead End and their upcoming album The Sun as it Comes, Lonely Wild took part in a mashup of music and dance which showcased how each complimented the other in what I personally would have thought was not possible. But give credit to both sides to make the songs and dance seem like they were made for each other. Underneath Lonely Wild's dirty ruggedness of American-rock lies a the beauty and sensuality trying to fight through the cracked dry floor of a desert wasteland. Considering that The Silver Lake Contemporary Ballet is used to much more wide open spaces to dance, they did a perfect job with the small and busy stage they had to work with. The Lonely Wild next plays at The Echo on June 14th and you can learn more about the Silver Lake Contemporary Ballet and support this non-profit group at their website right HERE. 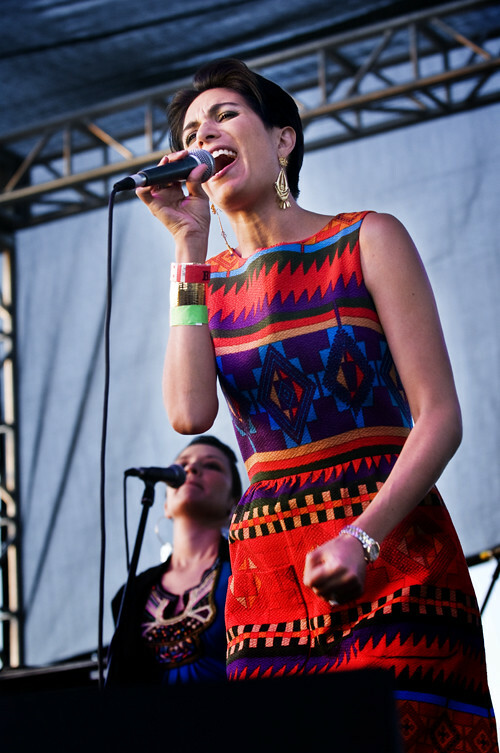 Of course, music isn't all the Silver Lake Jubilee offers during this two-day event. Nationally-recognized literary readings from writers, poets and emerging voices had their own stage presented by PEN USA and Molossus.co. Over at El Cid, comedians reigned as the line to get into the venue stretched for a block to see comics like Iliza Shlesinger, Jodi Miller and Natasha Leggero. And a nice touch for those who didn't want to plunk down $20 to go into the event, the Free Block Party Stage situated outside the gates also hosted bands, The Silverlake Conseratory of Music and the finalists from Public School Rocks. The Lonely Wild and the Silver Lake Ballet also made an encore performance on the stage. 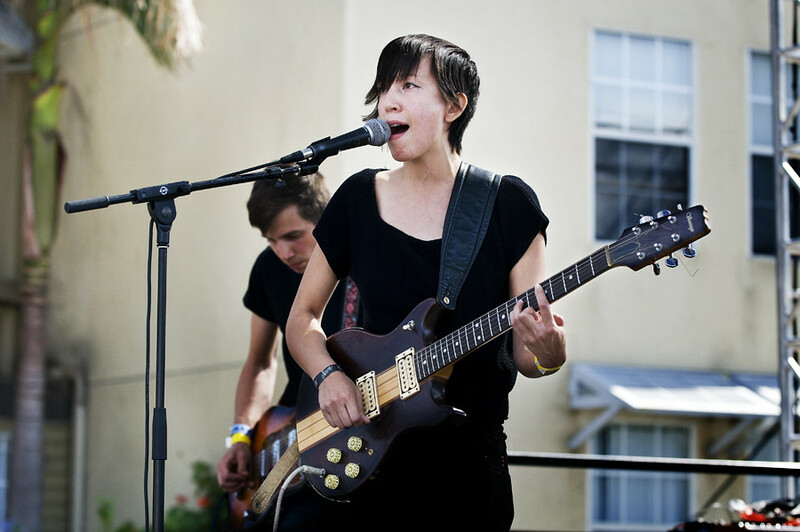 Electro-punk came in the form of Batwings Catwings, the LA group led by Dana Poblete. They're raw and loud in a good way. 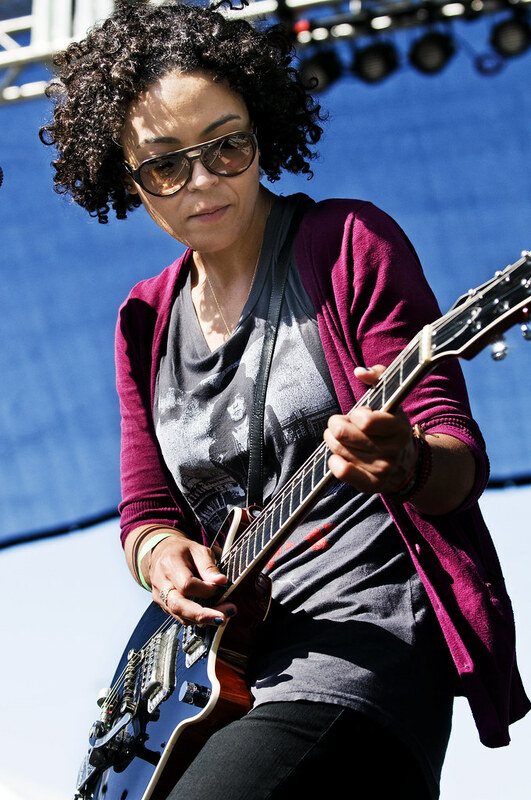 Watching Dana having fun on stage is infectious and it translates into their music. Their highly successful Peacock Collection EP last year put them on the map and got them noticed by critics and music bloggers. "Endless Summer" is a tornado of sounds and beats mixed together to form a yummy musical slushy while "Misbehaving" conjures early Red Hot Chili Peppers. Their new 7" includes "Radio" a song that starts deceptively quiet until Poblete and company smacks you in the face with full on sonic assault. Can you tell I really like this band? Catch them when they head to the Bay area, playing the Warehouse in Oakland on June 15th and then The Parkside in San Francisco on June 16th. 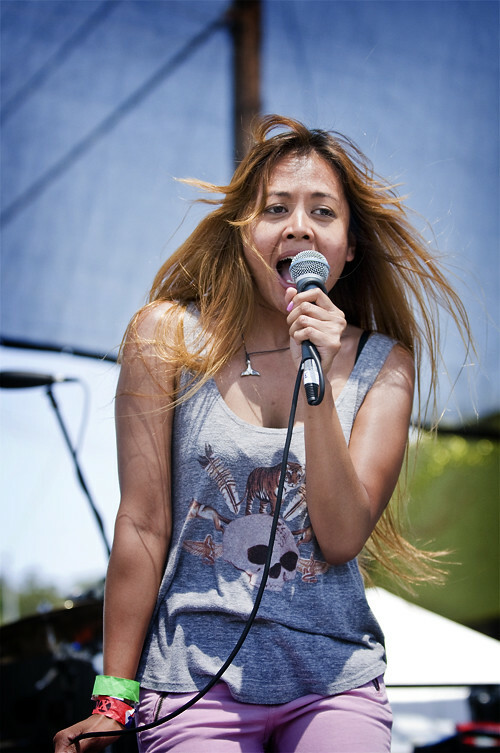 One of the most electrifying performances came from Tearist, the duo consisting of William Menchaca and the sparkplug of a lead-singer Yasmine Kittles who belts out her primal vocals with disregard for anything around her. They thrive on artistic destruction (or is it deconstruction?) which explains their name Tearist (as in tearing up a piece of paper not the tear that falls off your cheek.) Their no holds barred, DIY Electro-punk sound comes off raw in a jazz for punk sort of way. This was my first time seeing or hearing them and after a few songs, you realize that there is order in their chaos, like an arsonist finding beauty at a burning building. Chelsea Brown of Summer Twins. There's something about that So-Cal sound that Summer Twins catches perfectly. Responsible for this foamy, beach-pop with surf guitars and sugary melodies are sisters Chelsea Brown (guitar, vocals) and Justine Brown (drums, vocals). Those in the beer garden must've been in heaven, drinking cold beers under the hot sun while listening to the easy, cool sounds of Summer Twins. Formed in 2008 and based out of The OC, they were inspired by the dream-pop genres of the 50's and 60's and have released their most recent album in January from Burger Records. 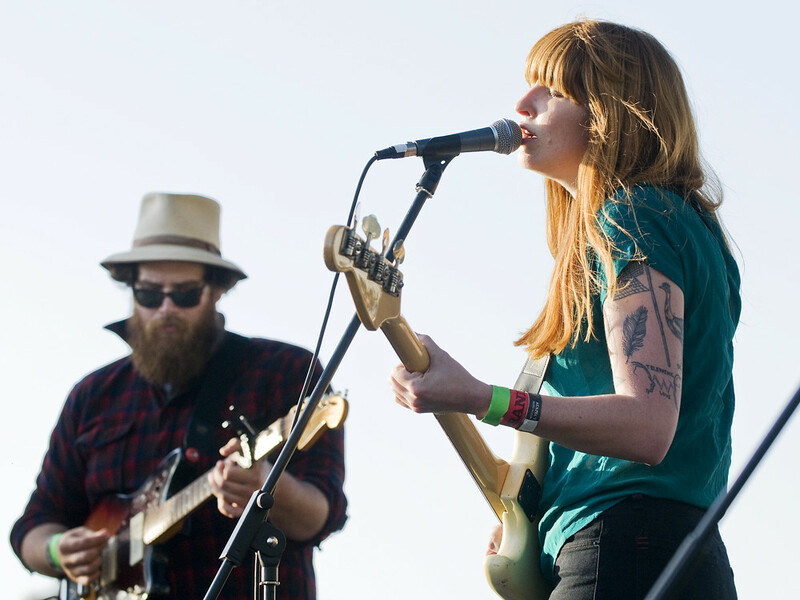 On the Sunset Stage, La Sera's Katy Goodman performs on day 2 of the Silver Lake Jubilee. 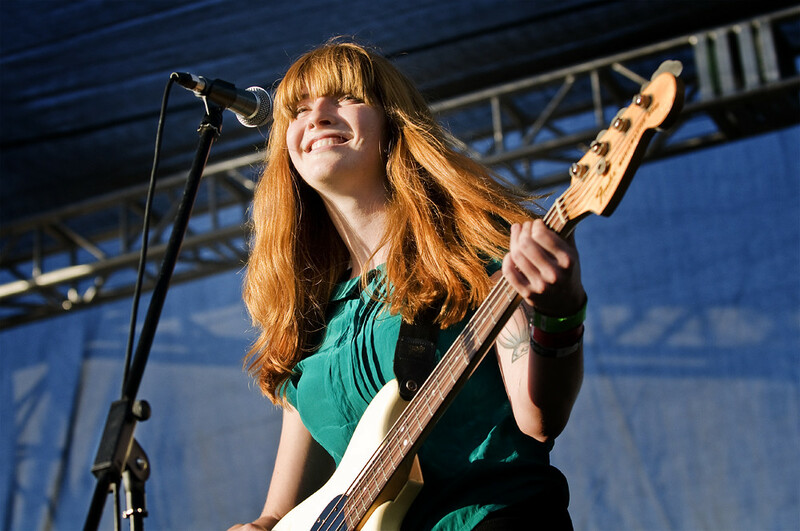 Another band perfecting the fuzz-pop beach sounds is La Sera's Katy Goodman, former member of Brooklyn-based Vivian Girls. But instead of the West Coast sound, Goodman captures the cotton candy boardwalk atmospheres of the heydays of Coney Island. With their vintage, sepia-toned flavors of dreamy-lush songs, if Instagram were an actual group, they would sound like La Sera. Her signature tranquil sway and breezy vocals gives lift to her melodies in songs like "Never Come Around" and "Deaths Hearts Grow Gold." Next week, La Sera heads out on their UK tour and return to Los Angeles to play the Viva Pomona Festival on July 14th and then The Echo on July 20th with Magic Trick. From 30 bands three years ago to over 60 this year. From three stages to six, with the success' of the past three years of the Silver Lake Jubilee, next year's event should only get bigger and better, solidifying it as Los Angeles' premiere music and arts festival.